The waterproof Rain Blocker with front legs offers a completely new solution for protecting your dog in the rain. 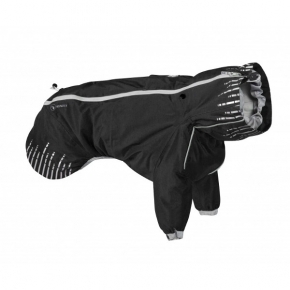 The Rain Blocker combines the protection of an overall and the ease of use of a coat. The front legs minimise the amount of dirt on the front parts of the dog while still being easy to put on and take off. The coat has a high collar with a specially designed rain trap which prevents water from getting inside the coat and along the dog’s neck. 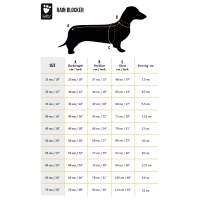 With the back length adjustment, and the neck and waist tightening drawstrings, the coat can be adjusted to fit your dog perfectly The coat is made of durable, flexible and comfortable outdoor fabric. Extensive reflectors in the collar and rear hem improve visibility in the dark. The outdoor fabric is produced in accordance with the Oko-Tex standard 100. See additional images for the size chart.